Heads up! 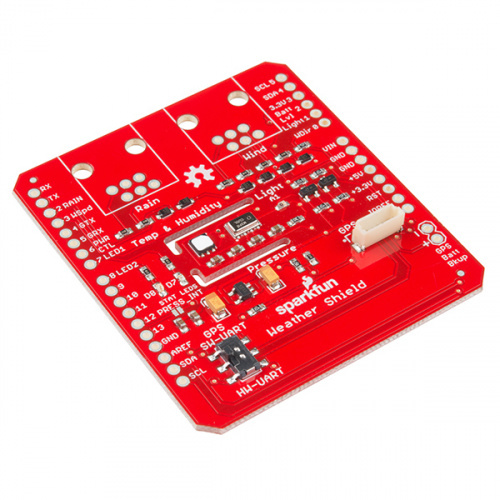 This is for the Arduino Weather Shield v12 [DEV-13956] that uses the Si7021. If you are looking at the older version of the weather shield, you should check out the older tutorial for DEV-12081 that uses the HTU21D. The Arduino Weather Shield from SparkFun is an easy-to-use Arduino shield that grants you access to barometric pressure, relative humidity, luminosity, and temperature. There are also connections to optional sensors such as wind speed/direction, rain gauge, and GPS for location and super accurate timing. Uses the Si7021 sensor, MPL3115A2 barometric pressure sensor, and ALS-PT19 light sensor. Check out the Hookup Guides for each of the sensors located on the shield for more information specific to that sensor. 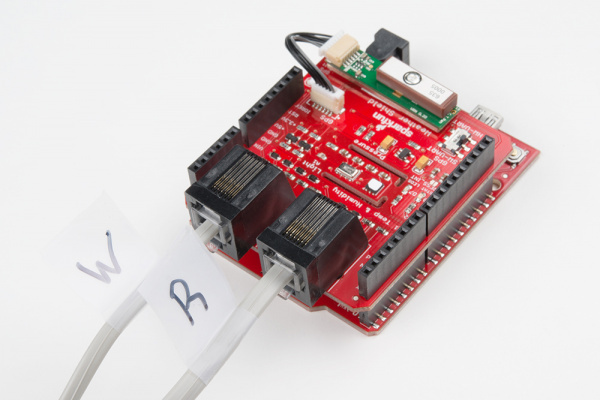 If you intend to use wind and rain Weather Meters with your ESP32 Environment Sensor Shield, check out our Weather Meter Assembly Guide. If you are unfamiliar with any of the concepts below, we suggest checking out those tutorials as well. Solder the stackable headers onto the shield, and insert the shield into your Arduino. You are welcome to solder in the RJ11 connectors to the top of the board as well. If you have the GP-735 GPS module, don't worry about attaching it at this time, we'll get to GPS later. Before uploading code to your Arduino with the Weather Shield attached, make sure the GPS UART switch is in the SW-UART position. Having the switch in the opposite position connects the GPS lines to the USB lines and may cause errors while uploading. Using the Weather Shield example in the Arduino IDE relies on the Si7021 and MPL3115A2 libraries. As of Arduino v1.6.x you can download the libraries through the Arduino Library Manager. 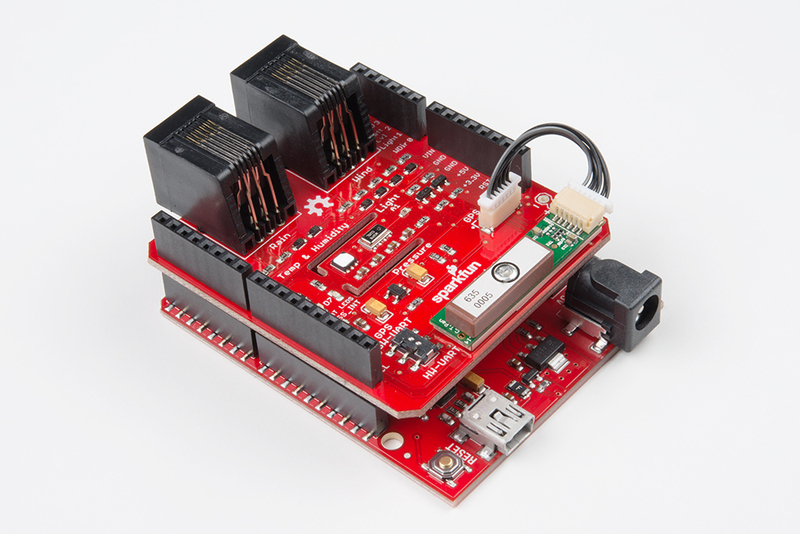 Search for and install "SparkFun MPL3115" and "SparkFun Si7021". Put your hand over the small clear device labeled 'Light', and watch the light level change to 0. Blow lightly on the humidity sensor, and watch the humidity change. Attach the GP-735 GPS module using the short cable. To secure the module, there is space on the shield to attach the module using double-stick tape. Grab the GPS example sketch from the GitHub repo that demonstrates using the GP-735 with all the other sensors. Load it onto your Arduino, and open the serial monitor at 9600. This example code assumes the GP-735 GPS module is attached. #include <TinyGPS++.h> //GPS parsing - Available through the Library Manager. ss.begin(9600); //Begin listening to GPS over software serial at 9600. This should be the default baud of the module.